Srinagar, February 4: “The country will give a befitting reply to those who are trying to foment terrorism in Jammu and Kashmir. We will tackle every terrorist and break the backbone of terrorism in Jammu and Kashmir, fighting it with all our might”, assured PM Narendra Modi while addressing the sea of people at Jammu and Kashmir on Sunday. Kashmir has always been more than a mere place. It has quality of an experience or a state of mind or perhaps an ideal. 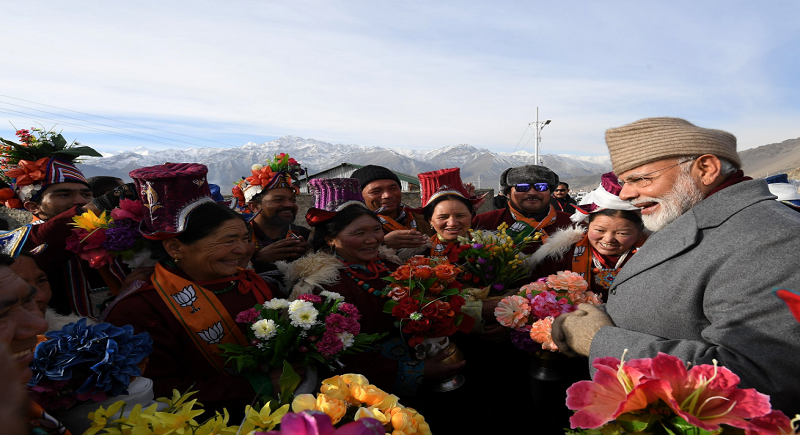 Modi, around the corners of Lok Sabha elections, visited the paradise on Earth and inaugurated variety of projects citing the infrastructural development. The Prime Minister setting his priorities during the visit, inaugurated developmental projects worth Rs 6000 crores. “All these projects are to make life easier for people around Srinagar”, he said. Focussing on the educational development in the state, Modi laid the foundation stone of AIIMS in the Vijaypur and Awantipora district. With the aim of improving the health infrastructure in the state, the institutions will be linked with the Ayushman Bharat - World's largest healthcare scheme, through which around 10 lakh people have benefitted since launch. “This scheme covers around 30 lakh people from Jammu Kashmir alone”, he added. Apart from laying the foundation for two AIIMS institutes in Jammu and Srinagar, PM Modi also inaugurated the University of Ladakh. This university marks the first-ever university to be set up in Ladakh region of the state. 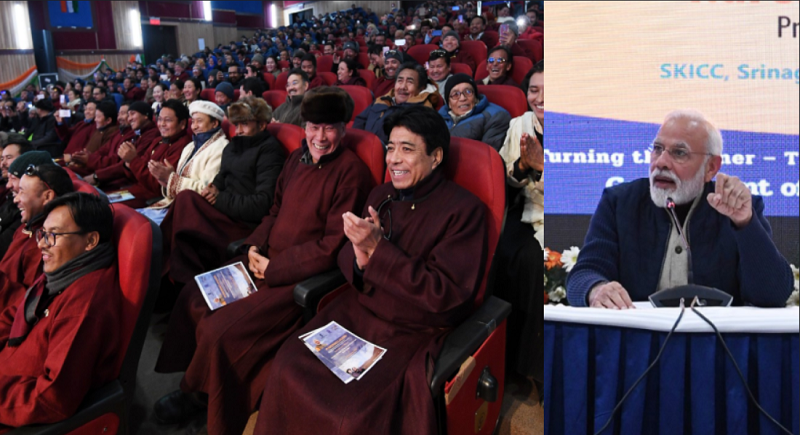 “Once built, it will be a cluster university comprising degree colleges of Leh, Kargil, Nubra, Zanskar, Drass and Khaltsi. The university will have administrative offices in Leh and Kargil”, the statement informed. “Young students constitute 40% of the population of Ladakh. There has been a long standing demand for a University in this region. With the launch of the University of Ladakh this demand would be fulfilled”, said PM Modi. Enhancing the employment opportunities for the youth in Bandipora and neighbouring districts, the first Business Process Outsourcing (BPO) was also inaugurated meanwhile. PM said that the Bandipora rural BPO will open up a window of opportunity for the youth in the region. 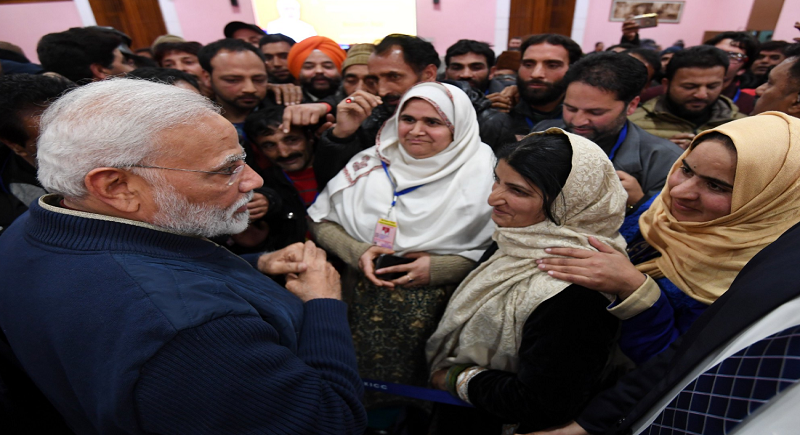 Stressing at the migrants issue, Modi assured that the Government would give full security to the Kashmiri migrants who want to come back and lead life here. Around 700 transit flats are being built to provide Transit accommodation for Kashmiri migrant employees. Work is afoot to employ displaced Kashmiris in 3000 posts, he added. Digital Launch of various projects under Rashtriya Uchchatar Shiksha Abhiyan (RUSA) by the press of button by him was another attraction. PM Laid the foundation stone of 3 Model Degree Colleges in J&K, at Kishtwar, Kupwara and Baramulla. He also laid foundation stone of Entrepreneurship, Innovation and Career Hub in University of Jammu. “400 KV D/C Jalandhar-Samba-Rajouri- Shopian-Amargarh(Sopore) transmission lane is open augmenting the grid connectivity in Jammu & Kashmir”, Modi asserted inaugurating the lane. Meanwhile, his interaction with the college students and the newly elected Sarpanches was a moment of delight for the people there. He complimented the people of the state for coming out to vote despite a fragile environment and said it shows their faith in democracy and the urge for the development of the state. A new temperament for Innovation, incubation and startups has come in India and Start up Abhiyan has gathered momentum”, asserted the Prime Minister addressing the young masses. He added around 15000 Start ups have become operational in India within a span of 3-4 years and half of them are in tier I & II towns. Inaugurating the Multipurpose Indoor Sports Facility at Sephora, Ganderbal, Modi said, “All 22 districts of Jammu Kashmir are covered by the Khelo India Campaign to scout the talent and improve sports infrastructure. The indoor sports facility will help the youngsters and give them a chance to play indoor games”. Amongst the major announcements in Srinagar, Prime Minister Narendra Modi declared that 100-per cent electrification of households has been achieved in Jammu and Kashmir under the central government's Saubhagya Scheme. At the function he will also laid the foundation stone of the 624-MW Kiru hydroelectric project in Kishtwar. It is a run-of-the-river project across the Chenab. Speaking at the launch, the prime minister said confidently that "Today I have inaugurated those projects whose foundation was laid by me earlier. We have delivered what we promised earlier. Once again I assure you that I will come back soon for the inauguration of the projects whose foundations have been laid by me today”, he signed off.